J- Shape Bent Glass Tempering Machine is a special plant used to produce the freezer (refrigerator) glass, showcase glass, etc. 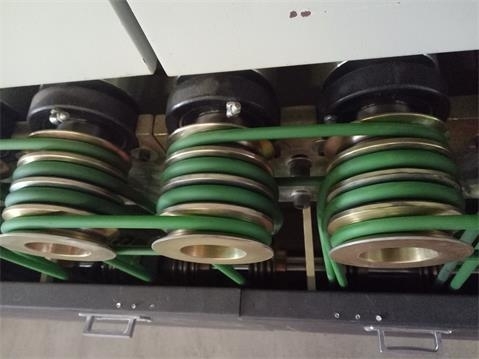 Bent section adopts soft shaft roller type. 1. Sectional heating, individual heating zones for each working position. 2. There are ceramic plates at the top of oven, which could ensure more even heating, avoid dregs falling. But the cost is higher and has higher requirements on the installation. 1. The bending forming is with servo motors & servo controllers. 2. The arc-changing has a very higher precision and speed. 4. The production process, temperature, time, air pressure, etc could be recorded. Therefore, testing production could be saved and production stability could be improved. Also, the production state in different batches could be tracked. 5. The machine has the history record and printing function. When glass come out from the oven, the computer will record the control parameters automatically for reference in future or pint them out. 6. Powerful operation prompt facility; if there is any wrong operation or fault, the dialog box will be called out to give you help. 7. Preventive function for the wrong operation. The data which affects the system running has been restricted strictly. The different operator has the different access right to system setting. 8. Power monitoring function, the monitoring program could monitor most of the sensors.